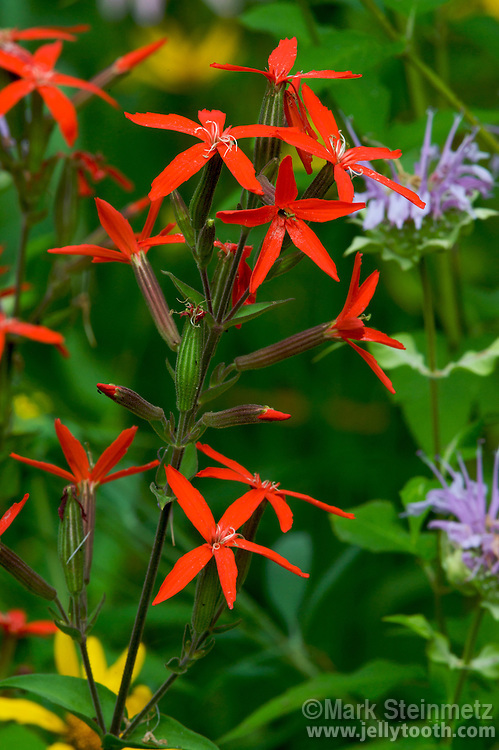 Royal Catchfly (Silene regia). A striking and somewhat rare wildflower of tallgrass prairies of the United States. The conspicous bright red color is uncommon in prairie forbs since most pollinating insects cannot see this color, however, it attracts some larger butterflies such as the Black Swallowtail, and hummingbirds. The common name comes from the stickiness of the flower, which often traps small insects. Closely related to the woodland Fire Pink wildflower.